Desalination is the process of removing salinity (dissolved salts) from a salt water source. 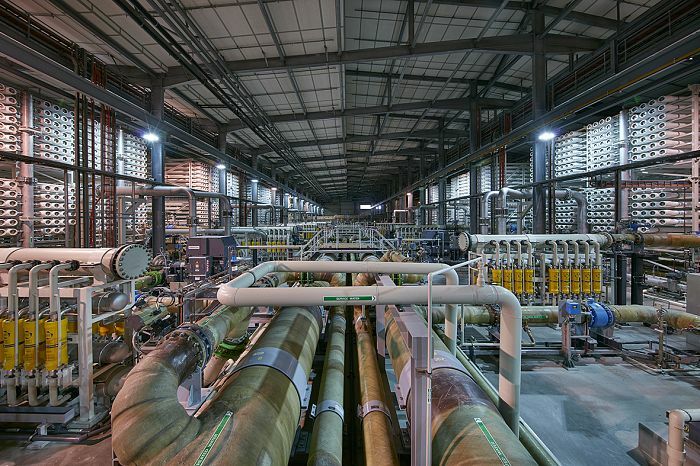 The Victorian Desalination Project uses a two pass reverse osmosis process to remove minerals and salts to produce water that meets strict quality requirements. Just like drinking water supplied from the water catchments, desalinated water from the Victorian Desalination Project is also treated to ensure the highest drinking water standards. These standards are included in AquaSure’s contract and have been set by the water authorities. They comply with the World Health Organisation Guidelines for Drinking Water Quality, the Australian Drinking Water Guidelines and Victorian health requirements. 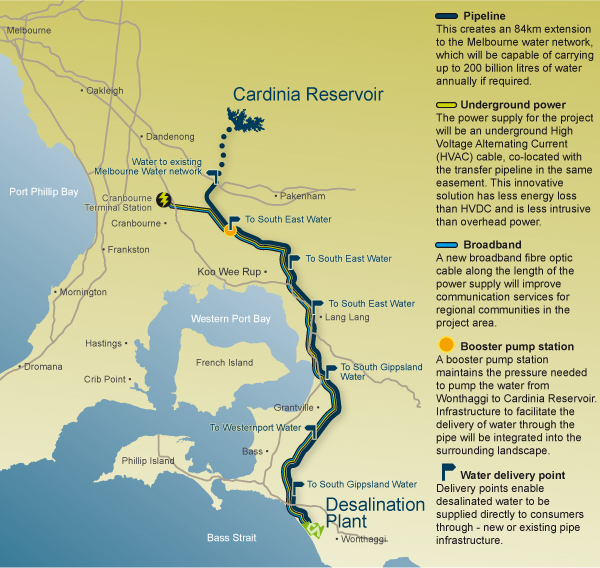 Water being processed at the Victorian Desalination Project is subject to online and real time monitoring, as well as an ongoing regime of independent laboratory testing, both during the water production process, and as it travels along the 84km pipeline to Cardinia Reservoir . Automated control systems provide an early warning of changes in water quality and automatically correct the process to bring water quality levels back to the required target range. This ensures water does not leave the plant unless it complies with required standards. Each delivery point along the 84km pipeline is fitted out with equipment that monitors water quality in real time. Customers will not be able to tell the difference between water from the desalination plant and the drinking water currently supplied in Melbourne.